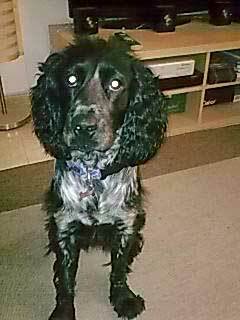 We have a cocker spaniel rescue dog who is 15 months old and has had the snip. We live on the Costa del Sol Spain where we regularly take Seve for his walks. He has been great in the six months since we took him over but recently he has started being aggressive to some people especially waiters when they approach our table to serve us. This is a recent thing and he does not do it at every cafe but seems to just suddenly take umbridge at people nearby. He's not aggressive with other dogs, he loves to play and loves his ball. We undertook training with him with a retired police-dog handler, but unfortunately he has returned to the UK. I am worried that he will bite someone when he gets aggressive and I keep him on a tight lead when we sit at a table. He's a great dog, has many friends both canine and human and I would hate to lose him. Any help you can give will be much appreciated to cure this problem. I'm sorry to hear you're worrying about your dog. It's not very nice when you're nervous about taking him out in public. Is it possible that he feels threatened in any way? I suspect that when you are anticipating a 'moment' you tighten his lead and he is picking this up. He will be feeling your apprehension - I know, it's a catch 22. I don't know how to advise you about his aggressiveness, but if you're really concerned, why not muzzle him when you're out in public. It's only an interim measure until you can find another professional trainer. Is it possible that he was mistreated by someone who dressed similar to a waiter, ie in uniform? It could be that the waiter reminds your Cocker of that person. If he's okay with other people, I can't think of anything else.